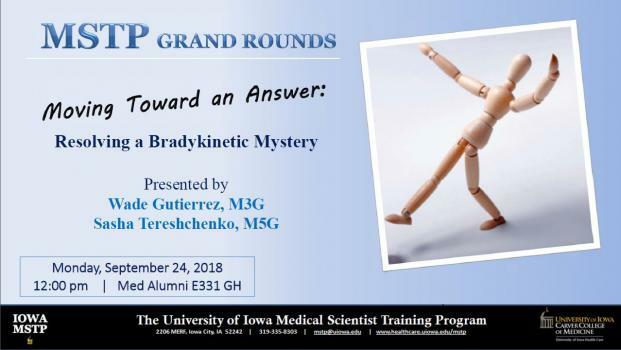 The MSTP Grand Rounds Series was conceived as a vehicle to showcase not only the MSTP program, but also to highlight the important biomedical research of University of Iowa investigators. These approximately 50-minute presentations are divided into two integrated sections: the first is a clinical presentation describing an interesting case and the relevant diagnostic information (laboratory tests, biopsies and imaging studies). The second section is a scientific presentation of a focused avenue of research directly related to the case; it may be in the area of diagnosis, pathogenesis, or therapeutic intervention. Grand Round presentations are made by MSTP students with advising from a faculty committee. Information about past Grand Rounds presentations is included below. "Moving Toward an Answer: Resolving a Bradykinetic Mystery"